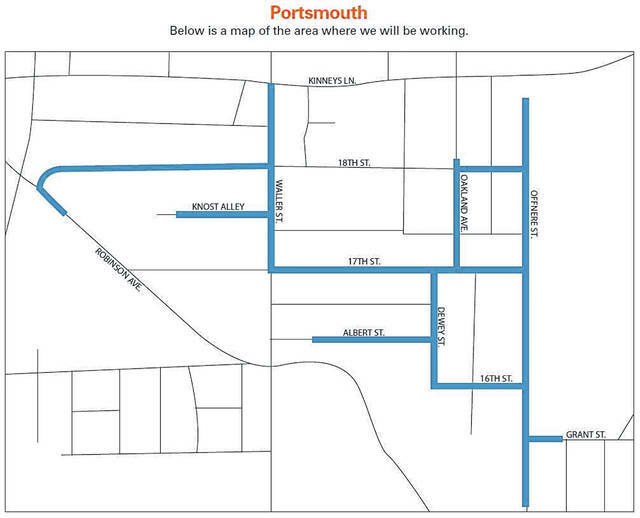 Columbia Gas of Ohio is preparing to begin a project to upgrade gas lines in Portsmouth with a $1.1 million investment. According to a release on the project, set to begin this month, the work area will be concentrated on Offnere St., 16th St., and 17th St., with additional work occurring on 16th St., Dewey St., Waller St., and Albert St.
Columbia states the work will affect roughly 140 customers and is inviting the public to an open house on Thursday at the Portsmouth Public Library at 6 p.m. to learn more information on the project. Per the release, Columbia Gas says contractors will work street by street to install new main lines and service lines up to each customer’s home or building. Inside gas meters will be moved outside, and gas service will not be interrupted until time to connect customers to the new gas system. “Gas service will not be impacted until it is time for Columbia Gas to connect the customer to the new gas system at their meter. For most customers, gas service will be interrupted for approximately two to four hours. Customers will get advance notice of this service interruption,” stated the release by Columbia. The company also noted that any surface that has to be disturbed will be repaired by Columbia Gas, including sidewalks, driveways, lawns and landscaping, and the project and clean-up is expected to be completed by summer. Once completed, the project is said to make gas lines safer, and reduce leaks by 40 percent.